Really cute short stories written by talented authors. Some amused me more than others, but they were all quite good. One was a WWII setting with a blind man. One was a high school reunion with a twist of school bullying and I was surprised and confused by this one a bit. One was a culinary chef. My favorite had to be this one in which this guy delivers a cake to his girlfriend, not knowing she's not there anymore. The cake ends up in the hands of someone else...and I was sitting there wondering if the lady would find him to tell him in time...and rooting for them both. Another story with a Vicar made me laugh. Witty and sarcastic. Cute. My only complaint is the recipes were in grams and stuff. I think it would have been nice to have an Americanized versions for those across the pond. Raspberries by Janet LoveringNice story. A woman bakes, gets postcards and talks to the mailman.Incense and insensibility by Juliet ArcherA modern Lady de Bourgh meets the new vicar. NiceThe Gift by Margaret JamesA meeting on a train can turn into more.Fixed penalty notice by Henriette GylandA bully story with a good twistTouch wood by Christine StovellNot for me.Angel cake by Liz HarrisA cute story about a mistakeSweet beginnings by Christina CourtenayThe making of a desert with a romantic twistKnowing by Sarah TranterCute story about love meant to be.Sowing the Seeds by Amanda JamesI was not moved at first, but it won me over. A Funny Thing Happened on the Way to the Fridge by Linda MitchelmoreA couple talk. happy. The Dessert by Kate JohnsonToo short, no time to get into it. Are Diamonds Forever? by Sue MoorcroftA bit confused. I guess I did not pay attention.Hot Chocolate for Two by Kathryn Freeman No idea what this one was about. That is the prob with short stories. If they fail to pull you in it's over. Sweet Memory by Janet Gover Bittersweet :/ Mulled Wine and Cupcakes by Laura E James He just broke up with someone so I do not feel this new HEA have a chance. Four-Year Itch by Beverley Eikli A woman messing up her life, silly you!Fallen From Grace by Berni Stevens Cute angel story.Devils and Heroes by Alison May okOperation Mike – Zana Bell A couple trying out kama sutra. HA.A Different Kind of Music – Angela Britnell All these recipes have made me to hungry to think!Just Add Milk – Rhoda Baxter Too short.Gut Instinct – Jules WakeI did not see that one coming! Some good, some forgettable, some ok. You know, the same old same old with anthologies. They all differ. Some manage to put in a good story in a short way. Some do not manage.It was an xmas (sort of) anthology so that was fun. But they were not overly xmassy. Some did not even mention when it took place. But a nice read for December. A delightful collection of romantic stories, some funny, some quirky, and some just passionate. Each story is accompanied by sweet recipe, usually central to the story. I particularly like Jane Lovering's amusing story "Raspberries" where the postman reads the postcards he has to deliver on his round. I shall also be trying the white chocolate and raspberry brownie recipe that helped to win him over! 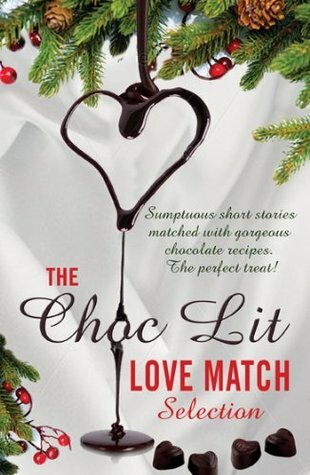 The Choc Lit Love Match Selectionwas a delightful chocalicious set of short stories.The stories were short and sweet, and the delicious recipe matched with each story was a fabulous tie-in. It’s a winning idea from Choc Lit : )A lovely and fun read between books, or during a commute. I loved these stories. What could be better after all than a good romance and chocolate?The recipes are a great idea.My own short story is included in this anthology and I'm proud and thrilled to be in such brilliant company! Some really cute short stories! Jane Lovering Christina Courtenay Sue Moorcroft Margaret James Juliet Archer Christine Stovell Henriette Gyland Liz Harris - Jane Lovering was born in Devon, England but, following extradition procedures, now lives in Yorkshire. She has five children, four cats, two dogs and doesn't believe in housework so the bacteria and dust are approaching sentience and now rank among the pets. Incidentally, she doesn’t believe in ironing either, and the children all learned self-defensive cookery at early ages. She works in a local school and also teaches creative writing, which are extreme ways of avoiding the washing up. Published since 2008, she writes romantic comedies which are often described as ‘quirky’. One day she's going to find out what that means. Jane is a member of the Romantic Novelists' Association and has a first class honours degree in creative writing. In 2012, her novel Please Don't Stop the Music won the Romantic Novel of the Year Award by the RNA.